What is the purpose of the Mobile Noticeboard? The Mobile Noticeboard is the perfect solution for using in business meetings, classrooms etc., due to the fact that it is fully mobile, so can be moved from room to room quickly and easily. It is double sided therefore pivotal but can be locked in to position; so can obtain a vast amount of information, as it is also supplied in 4 different sizes. This product is easy to assemble and as it is on wheels, can also be manoeuvred efficiently. The aluminium frame gives the noticeboard a neat and professional finish making it suitable to be used by employees in meetings and teachers at schools/colleges etc. 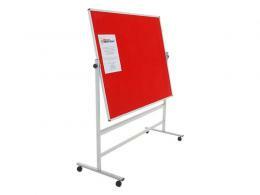 The Mobile Noticeboard can be used by those wanting to demonstrate information to others in an efficient manner. The pivotal and mobile aspect of the board allows additional room and movement to add notes, charts, diagrams, images etc., to help with your display. The noticeboard is supplied in 5 different colours and 4 different sizes, making it extremely versatile. The noticeboard has, as standard a 1 year labour/parts warranty.